I do hope you'll like it if you give it a try, Brooke. And you can definitely increase the fresh ginger if you'd prefer more of a ginger punch. Happy Thanksgiving to you! Mmm, can you come cook my Thanksgiving pies? And that is so interesting, to think that pumpkin, peanut butter, or root beer would be tastes that need to be acquired. Love to, Christina! It is interesting to think about various tastes in different cultures - my understanding is that some medicines have a flavor similar to root beer (the way we have cherry flavored here), so that one is understandable. I love this simple recipe Hannah. 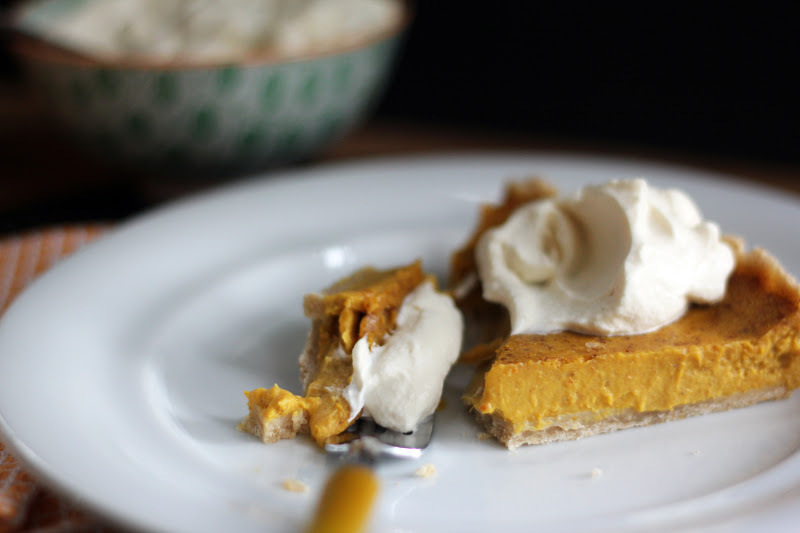 I think my daughter is going to try her hand at making the pumpkin pie this year and we also like it pretty basic and how we adore the leftovers for bkfst. It's all part of the festivities for us. And I love the idea of the maple syrup in the whipped cream. I'll tell my son - that's his job (along with a key lime pie). Thank you, Beth! Wow, key lime pie...now that sounds good. It appears you have some terrific bakers in your kitchen - happy pie making to all of you! Spectacular! Adore this spin on the holiday classic! Beautiful pictures as well. Hope you have a wonderful holiday Hannah. Your guests are in for a treat. Aw, thank you, Erina - so sweet of you. Wishing you a lovely holiday, too. You have quite an exciting week ahead! Thank you, Susan! I hope you enjoy a warm, cozy Thanksgiving celebration. I just made my first pumpkin pie in ten years the other day for my son's 1st grade Thanksgiving potluck. You and I have similar taste. I like the simple spices of ginger and cinnamon. 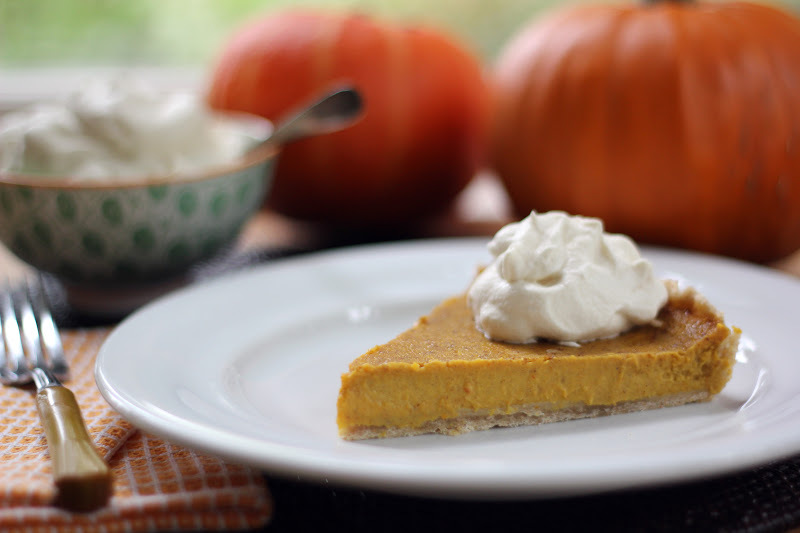 Maple sweetened whipped cream sounds delicious. Happy Thanksgiving to you and your family! Thank you, Karen - I hope you and your family had a wonderful Thanksgiving celebration. And I hope you enjoyed lots of pumpkin pie! I have to confess, I could easily eat an entire bowl of maple sweetened whipped cream...creamy desserts are a weakness of mine. I definitely indulged in some over the weekend! I hope you enjoyed a fun, festive Thanksgiving! I wish I could bake a pie for you, Nami! The maple whipped cream is pretty decadent indeed. 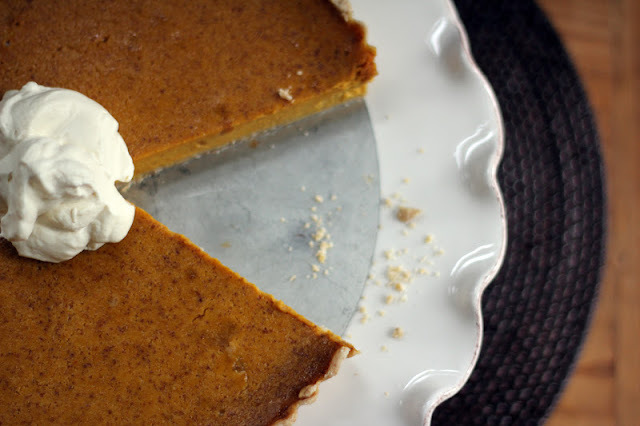 It'll be pumpkin pie season for awhile, so hopefully you get to indulge in some. Have a lovely weekend!